Transparency Market Research (TMR) has published a new report titled ‘Implantable Cardiac Monitor Market- Global Industry Analysis, Size, Share, Growth, Trends, and Forecast, 2018–2026.’ According to the report, the global implantable cardiac monitor market was valued at US$ 679.24 Mn in 2017. The market is anticipated to reach US$ 1,464.26 Mn by 2026, expanding at a CAGR of 8.7% during the forecast period. Rise in the incidence of cardiac arrhythmia and increase in geriatric population are expected to augment the global market from 2018 to 2026. The global implantable cardiac monitor market is projected to expand, owing to prolonged ECG monitoring function, acceptance of and rise in demand for subcutaneous insertible cardiac devices, and increase in technological advancements. The global implantable cardiac monitor market is expanding at a high growth rate, driven by an increase in prevalence of cardiac arrhythmia. As per research, about 14 million people are suffering from some forms of cardiac arrhythmia in the U.S. with more than 4 million Americans have recurrent arrhythmia and 5 million Americans are currently living with heart conditions. In Asia Pacific, Japan is expected to reach 1 million cardiac arrhythmia patients in the coming years. Prevalence of cardiovascular diseases such as heart stroke and improper function of the heart are driving the need for cardiac monitoring devices in order to monitor irregular heart rhythms. Elderly people are often prone to cardiac arrhythmia, especially atrial fibrillation, which occurs in old age, resulting in need for cardiac monitors. External cardiac monitors are not feasible for old people to wear or carry on a day to day basis. This has led to an increase in the adoption of insertable cardiac monitors. Implantable cardiac monitor devices offer better ECG monitoring service and also last for three years. Rise in the geriatric population demands better treatment options, which in turn, is likely to provide opportunities for companies operating in the global implantable cardiac monitor market. 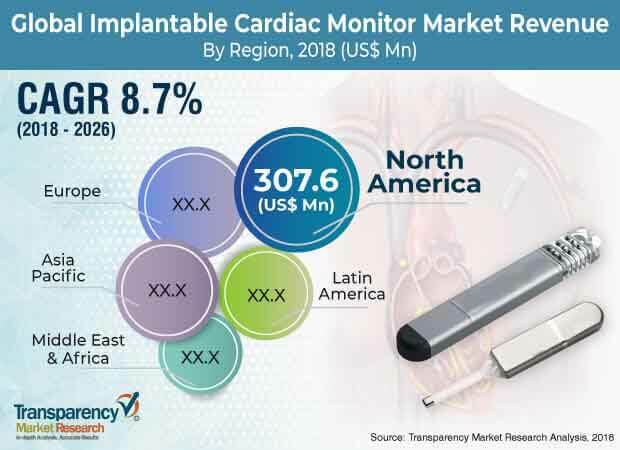 North America dominates the global implantable cardiac monitor market, owing to the approval of cardiac monitors and the presence of major players in this region. Implantable cardiac monitors are niche, and this offers significant opportunities for companies to expand and invest in the region. Also, a rise in the prevalence of cardiovascular conditions that need further monitoring contributes to the demand for implantable cardiac monitors. Rise in atrial fibrillation, a type of cardiac arrhythmia, and other arrhythmias drives the market in the region. A subcutaneous cardiac monitor is a new innovation that is gaining trust and popularity among the geriatric population, owing to its prolonged ECG monitoring benefits. Therefore, easy adoption of ICM is fuelling the market in the region. Key market players have invested in establishing a better way for the treatment of patients by providing innovate ways of monitoring irregular heart rhythms on smartphones. This innovation allows physicians to directly access data and keep track of patients’ condition. Also, companies are readily investing in this type of technology. They also hold a strong portfolio of products in the pipeline that are ready to enter the market. Due to the presence of few players in the global market, other companies have a significant opportunity to enter the market with innovative solutions. Key players dominating the global implantable cardiac monitor markets are Medtronic, Abbott, Biotronik, Angel Medical Systems, Inc., vectoriousmedtech.com, Boston Scientific Corporation or its affiliates, and Biosense Webster, Inc.. Major players are focusing on mergers and acquisitions and are incorporating innovative technologies to expand their footprint in the global implantable cardiac monitor market.